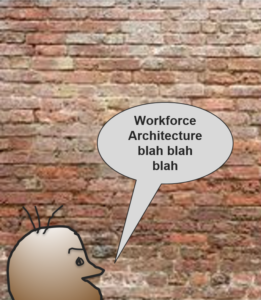 For the longest time we have talked about the Workforce Architect, and the artefacts that make up a Workforce Architecture. Until now, it has been like talking to a brick wall. But now it’s an imperative. Artificial Intelligence (AI)-Machines that can make predictions using deep learning, neural networks, and related techniques. What had the greatest impact on me was – it’s not just re-engineering of existing jobs, it’s redefining work and work processes to make the best use of both technology and human capital. This is the domain of the Workforce Architect! Start looking for your Workforce Architect now – sooner rather than later.